I don’t know about you but once spring arrives (even if the weather doesn’t quite agree), I’m in the mood for lemon! Lemon bars, lemon cake, lemon cookies…just bring on the lemon. 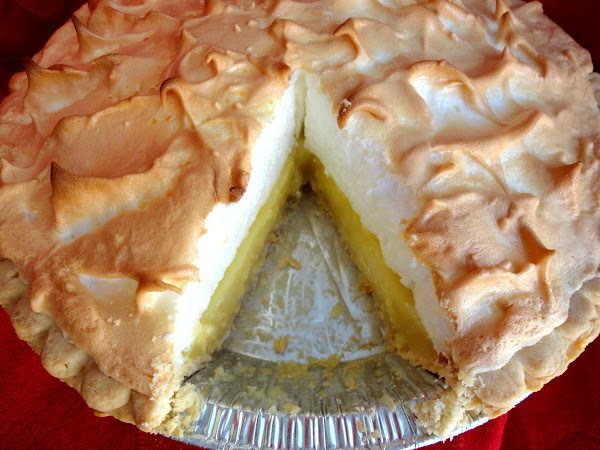 I thought the week of Easter would be a great time to share a recipe for lemon meringue pie, which I just started making a few months ago. My SIL, Joan, loves lemon meringue pie and I made her one for Christmas (everyone got a home made pie for Christmas last year since we were too po for many store-bought ones). It was my first ever lemon meringue pie, and as firsts sometimes go, it was bad. I didn’t read the instructions close enough and the filling never set up. It was lemon soup pie. Thankfully, I had enough time to make a second, which turned out well. My beautiful sister-in-law with her pie. To my surprise, after licking the spoon which I used to scrape the filling into the crust, I found I really liked lemon meringue pie, or at least the filling. You’d think a person who enjoys lemon desserts would assume that lemon meringue pie was the bomb-diggity, but no, I never had tasted a single bite because I was somehow sure it wasn’t worth eating. I know, right? I suddenly found myself dying to have a slice of lemon meringue pie, to taste it in its full glory, so I made it to bring to a dinner party in January. That single small slice was so good, I needed more, and made a whole pie just for Dennis and I. And together, we managed to eat the entire thing in a shamefully small period of time. Personally, I would prefer this pie with a whipped cream topping. However, using the egg whites works so perfectly since you have them leftover after using the yolks in the filling. If you don’t mind using your egg whites for another purpose, feel free to use whipped cream here. I think that would be the magics. Preheat oven to 350F. Stir the egg yolks together in a heatproof bowl and set aside. In a medium saucepan, whisk together the sugar, cornstarch, and salt. Whisk in the water and turn on the heat to medium. Bring the mixture to a boil while stirring, boiling until it is quite thick, at least one minute. Remove from heat. Add a spoonful of the hot mixture to the egg yolks at a time, stirring in between additions, until 1/3-1/2 of the hot mixture has been added. Scrape the egg yolk mixture into the pan and whisk it all together. Return to the heat and cook for another minute while stirring. Remove from heat and stir in the butter until melted. Add the lemon zest and lemon juice, stirring until combined. Scrape into the baked pie crust; set aside. For the meringue, combine the egg whites and cream of tartar in a stainless steel or glass bowl that is completely grease free and beat with completely grease-free beaters on medium speed for about a minute, or until soft peaks form. Increase speed to high and beat in sugar gradually until glossy stiff peaks form and sugar is dissolved. Spread over hot filling all the way to the edge, making sure the meringue touches the pie crust all the way around, to prevent shrinkage. Bake in preheated oven 12-15 minutes or until meringue is light golden brown. Cool completely before slicing, about 4 hours. Recipe source: adapted from the recipe on the back of a Pillsbury Pet-Ritz frozen pie crust package. Posted in Pie and tagged baking, Easter, lemon meringue pie, spring. Bookmark the permalink. Yum! I love lemon meringue pie, and haven’t had it in forever! It looks perfect! Veronica-You’re pie looks perfect! You are such a talented baker. If you lived in Kansas City, you would surely be featured on the Food Network! Serioiusly! Now… tell me how your meringue didn’t weep or shrink away from the crust? I have tried all number of things, using powdered sugar instead of granulated sugar, spreading the meringue on hot filling. Nothing works. It always shrinks and any big, huge, tall meringue, eventually loses its steam for me and shrinks in height and away from the crust. 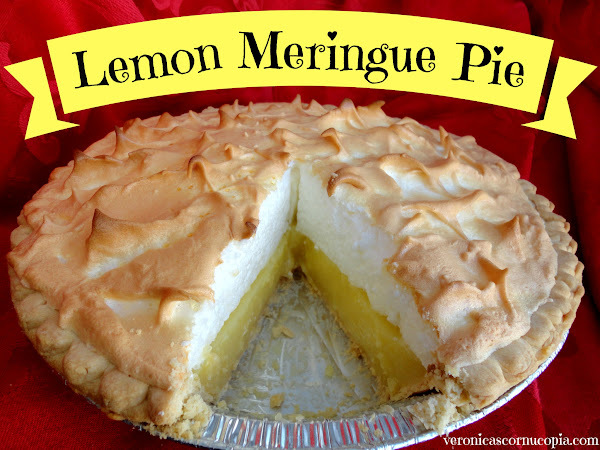 I LOVE lemon meringue pie, with a big, tall meringue, and your pie is the bomb diggety! Pshaw! As for the meringue, I’ve heard you have to make it on a dry day-no moisture and definitely no rain. Even still, mine wept a little. I’ve heard of a ‘no weep’ meringue that has cornstarch in it. Time to Google–I plan to try it next time. What a GAWGEOUS pie! The meringue is perfect too. What awesome Christmas gifts to receive! I guess it’s time you share this. ;-} I love lemon and would sooo enjoy a piece this very minute! Dang girl. Better late than never, right? Lemon Meringue Pie is deeeeelish! I like your idea of using whipped cream in place of the meringue topping. Both yummy. Going to check out some of your other lemon treats. I have a boatload of Meyer lemons waiting for their destiny! This is my favorite kind of pie! My grandma makes such an amazing one! She wants to teach me, but I know I will screw it up. 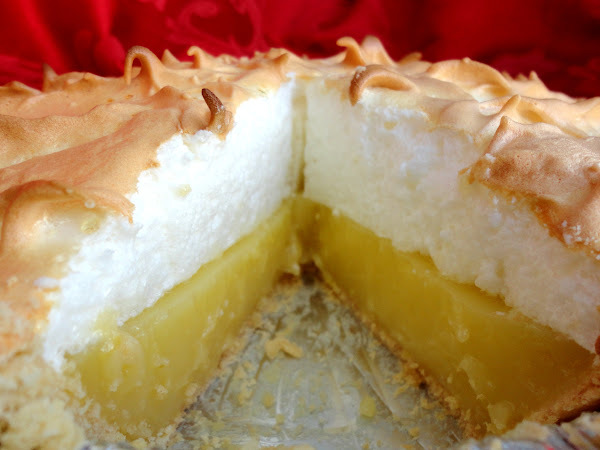 I love lemon and have never had this kind of pie, it looks delicious. I hope the Spring weather heads your way soon. OMgosh, it is intimidating! I felt so inept, I seriously felt like I’d never baked anything before. it was so disconcerting for baking to suddenly feel so foreign to me. But that’s how we grow as cooks and bakers, trying new things. One step at a time, Suzie, and I know you’ll be making lemon meringue pies too one day! What a gorgeous meringue pie, Veronica! I wish I could have one just for me. I LOVE the filling of lemon meringue pie but not the meringue so much…it is so gorgeous though! Mmmm yum, your pie looks so good! So many lemony recipes lately I have seen. (I have no idea why I channeled Yoda there.) That meringue looks just perfect! I LOVE LOVE LOVE lemon meringue pie! Gurl you know I’m a lemon sistah! I’m puckering up with pleasure just at the thought of that pie. I agree that it would be better with a whipped cream topping, but I’d never complain about the meringue if it had all that lemony goodness! Your lemon meringue pie looks exactly the way I like mine to be. Fantastic! This looks absolutely delicious, have never made a lemon meringue pie before so can’t wait to try!